CP/CENT/INT/7. A miscellaneous box containing files ranging from reactions to "Browderism" in the CPUSA during the mid-1940s to the Soviet invasion of Czechoslovakia in 1968, and various chiefly European conferences from the 1970s and 1980s. CP/CENT/INT/07/01. Conference of 29 Communist and Workers' Parties of Europe, Berlin, 1976:- Novosti pamphlet report, CPGB pamphlet report, Yugoslav report, Morning star report, etc. Created June 1976. CP/CENT/INT/07/02. Conference of the Communist Parties of the Capitalist Countries of Europe, Brussels, 13-14 June 1977:- preliminary document by working group, report of the conference and English translations of some of the proceedings. Created 1976-1977. CP/CENT/INT/07/03. International Scientific Conference:- "Karl Marx and our Time : the Struggle for Peace and Social Progress", Berlin, 1983:- Gordon McLennan's contribution. Created 11-16 April 1983. CP/CENT/INT/07/04. International Conference of Women from Communist and Workers' Parties of Western Europe, Wuppertal, 30 May-2 June 1985. Speech by DKP Chairman Herbert Mies, report by British delegates Nathalie Hadjifotiou and Danielle Stone, note from CPGB National Women's Advisory Committee to CPGB EC. Created 1985. CP/CENT/INT/07/05. Conference of West European Communist Parties on the Crisis, Paris, 12-13 June 1985:- conference papers in English, French, Spanish, German, correspondence with the PCF. Notes and document prepared for CPGB delegate Brenda Kirsch by Gerry Pocock, press reports. Created 1985. CP/CENT/INT/07/06. 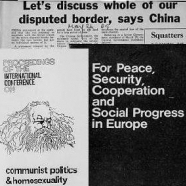 International Conference on Communist Politics and Homosexuality, hosted by the Communist Party of the Netherlands, Amsterdam, March 1986; including 2 pamphlets containing contributions and relevant articles. Created 1986. CP/CENT/INT/07/07. Materials relating to diverse projected and actual Communist Conferences:- documents, correspondence, Soviet newsand other press reports, pamphlets, including a Declaration of the Meeting of Communist Parties of Latin America and the Caribbean, articles on Soviet-Afghan talks. Created 1971-1980. CP/CENT/INT/07/08. Papers collected by John Gollan on the Soviet invasion of Czechoslovakia and the consequent crisis. Press cuttings, CTK Daily Press Survey (some issues), CPGB statements and documents on the crisis, materials from the Japanese and Italian CPs, Soviet material, Socialist International material, notes. Created 1968. CP/CENT/INT/07/09. Papers collected by John Gollan on the Soviet invasion of Czechoslovakia and the consequent crisis. Press cuttings, CPGB statements and documents on the crisis, materials from the PCI, Czechoslovak CP material, Soviet material. Includes references to CPGB criticism of the intervention at he 1969 World Communist Conference. Created 1969. CP/CENT/INT/07/10. Browderism:- translation of article by Jacques Duclos criticising the Communist Party of the United States of American (CPUSA)'s decision to convert itself into a "Communist Political Association" in 1944, and WNV report of the CPUSA's reconstitution. Also includes CPGB statements and [...] CP [...] . Created 1944-1945.